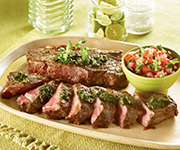 A rich flavored classic marinade...fire up the grill and go for it! 1. Thinly slice steaks. Grate ginger and place into glass baking dish, along with other marinade ingredients, and mix well with metal spoon (as wooden utensils will absorb and retain the flavors). Add the sliced beef and mix until all pieces are saturated with marinade. Cover glass dish and marinade beef for 45 minutes. 2. Grill until desired tenderness, and enjoy. Create shish kabobs by alternating the ginger beef strips on a skewer with pineapple, sweet onions, cherry tomatoes and red pepper strips, and grill to perfection.